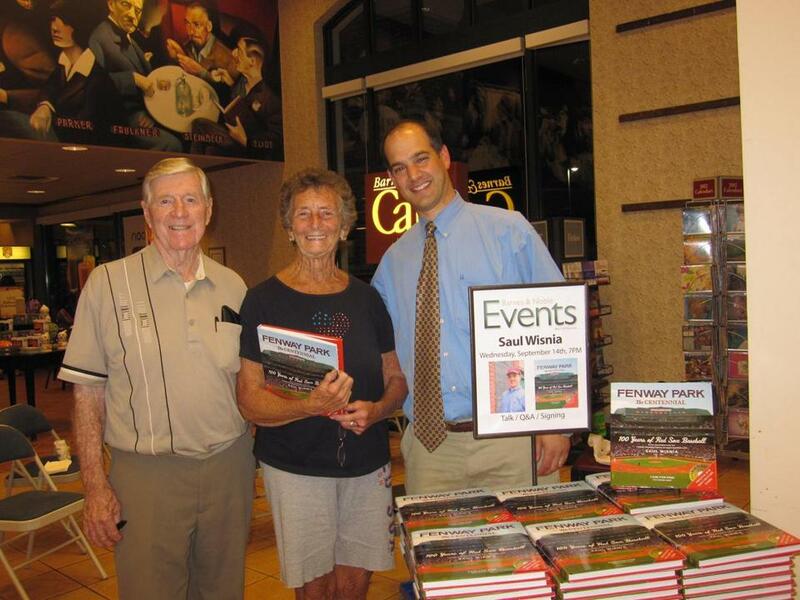 Saul Wisnia (right) with former Red Sox manager Joe Morgan and Fenway fan Pat Conley at a recent book signing in Walpole. Saul Wisnia was 8 when he sat in the outfield grandstand at Fenway Park for Game 6 of the 1975 World Series, an unforgettable night capped by the dramatic home run that Carlton Fisk coaxed into hitting the foul pole in the bottom of the 12th. Thirty-five years later, the Newton native was interviewing his childhood heroes for “Fenway Park: The Centennial,’’ his recently published book, which includes a DVD narrated by Fisk. “I caught the Red Sox bug, and by my early teens was routinely walking to the BC trolley stop and taking the Green Line into Fenway with friends. As a young history buff, everything about the ballpark fascinated me - especially the fact so little about it had changed since Babe Ruth played there. A graduate of Newton North High and Syracuse University, Wisnia has been senior publications editor at the Dana-Farber Cancer Institute in Boston since 1999. He has authored, coauthored or contributed to numerous books on Boston and general baseball history, and is a member of the Boston Braves Historical Association and the Boston chapter of the Society of American Baseball Research. “So, needless to say, Fenway is deep in my blood. I have written about the park for more than 20 years in articles and books, including my 2008 book ‘For the Love of the Boston Red Sox,’ ’’ he said. Wisnia, whose player interviews ranged from Hall of Fame second baseman Bobby Doerr to current members of the team, said he gleaned a special enjoyment from conversations with the players he grew up watching, including Fred Lynn,Rich Gedman, Bob Stanley, and Bill Lee. He also cited a memorable interview with Rob Barry, “who is still the park’s most glorified vendor, renowned for his ability to throw peanuts with incredible accuracy, skills honed as a pitcher at Northeastern University,’’ Wisnia said. Other tidbits: the individual at Fenway who was fulfilling a promise to a buddy by spreading his ashes in the outfield; former team president Haywood Sullivan’s daughter recalling how she played hide and seek at the park as a youngster; and Nicky Jacobs, whose family has had a peanut cart at the same spot at Brookline Avenue and what is now Yawkey Way since his grandfather, Pete Davis, hawked there on opening day in 1912. Wisnia, who has also published a photo-essay book on the Red Sox-Jimmy Fund connection, will hold 7 p.m. book signings Tuesday at the Barnes & Noble in Chestnut Hill, and Oct. 17 at the Brookline Booksmith. A tip of the cap is due Bedford High coach Dave Wilson, who earned his 500th career victory when his varsity girls’ soccer team shut out Boston Latin, 2-0, on Monday. The 65-year-old Wilson has been coaching for 39 years, including 29 at Bedford. As the high school’s softball coach, he led the team to the state title in 1990. With his daily hourlong commute from Westminster taking its toll, Wilson said, this might be his last year on the bench. The fourth annual Maynard High School Athletic Hall of Fame banquet will be begin at 6 p.m. on Nov. 19 at the Elks Lodge on Powdermill Road. The honorees include Albert Alexanian (class of 1953, football), Len Curcio (girls’ basketball coach), Jarreau DeLeon (’94, the career basketball scoring leader), Harry “Bum’’ Hatch (’61, football and baseball), Bruno Kansanniva (’39, track and field), Barbara Moynihan (’74, three-sport athlete and field hockey coach), Walter Murphy (’72, track and field) and Albert Rogers (’46, football, basketball, and baseball). Also, the high school’s 1992-93 Division 3 state finalist boys’ basketball team and its 1984 girls’ field hockey team, which won three straight Midland League titles, will also be inducted into the hall. Jay Manning, ’69, an outstanding football player and class president and Raymond Hooper, longtime team doctor, will receive the Black and Orange Award for 35 years of support to the athletic program. Tickets are $35 and available through Nov. 11 (or until sold out) by calling 978-764-5279 or 978-897-7894 or by e-mailing mjtbrannelly@comcast.net or edmully@msn.com. The “One Ball Two Strikes’’ Greg Montalbano Golf Classic, held Sept. 23 at the Highfields Golf & Country Club in Grafton, raised $28,000 for young patients at the Dana-Farber Cancer Institute in Boston. The tournament honored Montalbano, a Westborough native and star pitcher at St. John’s High in Shrewsbury and Northeastern University. He also pitched in the Red Sox system from 2000 to 2005, and with the Can-Am League’s Worcester Tornadoes from 2005 to 2006. Montalbano battled cancer for 13 years before his death on Aug. 21, 2009. Jason Mastrodonato contributed to this report. Marvin Pave can be reached at marvin.pave@rcn.com.